​We all want our Mac to run fast, and hate it when the machine keeps freezing (or frozen, sometimes). When that happens, frustration sets in. In this article, we're going to share some of the common Mac freezing scenarios together with quick fixes to unfreeze the Mac. For better reading experience, we break down all common scenarios into five sections. Just navigate the Table of Content below to help yourself jump to the right section based on the scenario that best matches your case. Sometimes, a Mac keeps freezing on certain apps with a typical symptom like being unresponsive. Other times, macOS may hang up while you surf the Internet via a web browser like Safari, Chrome, Firefox, etc. Possible causes vary. For example, there might be too many login items auto launching upon start-up, or lots of background app clutter. What to do? The easiest fixes include: disabling the number of login items, force quitting the frozen applications, updating your Mac to latest macOS (i.e. High Sierra), etc. Most of the time, your Mac will run slowly, hang up, or become totally frozen when the computer runs out of memory and it has to use some of the disk instead of RAM. 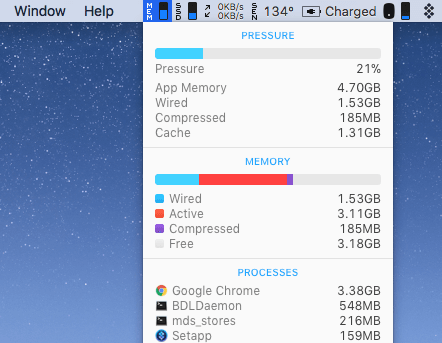 You can use iStats Menus to check real-time memory usage and other key performance metrics of your Mac. It's also an app we recommend for diagnosing Mac issues. "These symptoms might mean that an SMC reset is necessary: ... your Mac performs unusually slowly, even though its CPU isn't under an abnormally heavy load." The best way to clean up Mac drive is to use Cl﻿eanMyMac 3, an incredibly simple and intelligent app that can help you detect all type of system junk and unnecessary files. By doing so, you can quickly free up gigabytes of disk space. It's quite common that Mac freezes on certain apps, especially those poorly developed ones which require substantial system resources than they should. macOS usually indicates the situation by popping up a notification Application Not Responding. This happens more often while you are using heavy apps like image or video editing software that demands more system resources than other light-weighted apps. The first yet no-brainer solution is: keep waiting until the app unfreezes by itself. 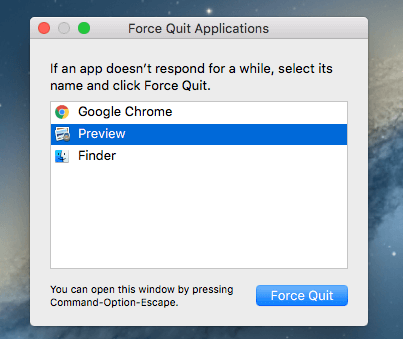 If it's still unresponsive after a few minutes, try force quit the application. To do this, move your cursor to the application icon on the dock (normally located at the bottom of your screen). Then right click on the app icon. Wait until a pop-up menu displays. macOS will then present the option for you to "Quite." Alternatively, you can click on the Apple logo, select Force Quit, then highlight the app you want to exit, and hit the blue "Force Quit" button. Next, check whether the app has a newer version. For example, if you are using Photoshop, go to Adobe's official website to see if the version you're using is the latest. Those of you who are used to download programs from the Mac App Store, you can also go to Software Update to check if there's a new update. Bottom line: always keep your apps up-to-update because a newer version usually fixes bugs and errors that could eliminate app frozen times. According to Apple Support Community threads, some users have been experiencing difficulties with Safari after updating their Macs to latest macOS High Sierra 10.13, such as web browser crashes or keeps freezing. How to fix: first remove the third-party extensions you recently installed. Because those plug-ins/extensions might be incompatible with the web browser you use. Open Safari, on the top click Safari Menu, select Preferences. 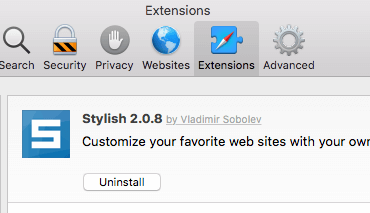 Under the Extensions tab, select and uninstall the ones you recently installed. If the web browser continues to freeze, we'd recommend a full macOS check-up and update. Make sure to back up your data before you do this. Updating macOS is a fairly simple process. Simply click on the Apple logo, then App Store option, you'll see the number of updates available. Once updated, it should fix the browser keeps freezing issue and prevent your Mac from other issues in the future. 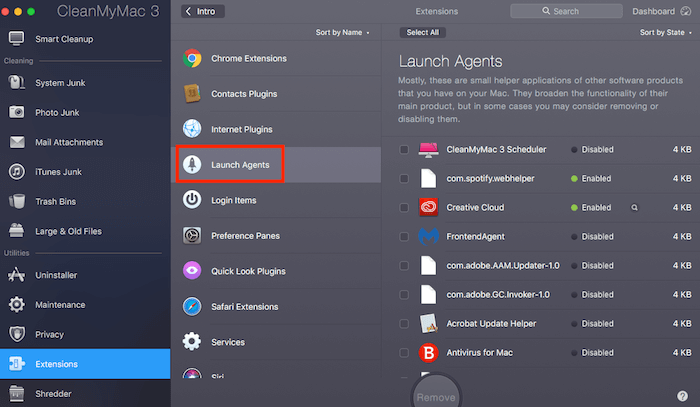 If your Mac often freezes upon startup, chances are you have excessive login items or launch agents. Those are applications, services, or server connections that run automatically when your Mac starts. "...if your Mac starts up from a disk other than the one selected in Startup Disk preferences, or a question mark icon briefly appears before your Mac starts up, you might need to reset NVRAM." Disabling unnecessary startup items is simple, just do a Spotlight search for "Users & Groups" (alternatively, click on the Apple icon, then System Preferences, click on Users & Groups). See the Login Items tab next to Password? Here you'll find a list of applications and auto-start programs, feel free to remove those you rarely use. Resetting NVRAM is easy and risk-free. Simply shut down you Mac and press the four combination keys as shown in this video guide. If the entire system of your Mac frozen and you can't even move the cursor around. Your last option is to force reboot the Mac manually. If you are on a MacBook Pro or MacBook Air, hold down the Power button (located on the keyboard for newer MacBooks) for 5 seconds or so, until the system shuts down completely. Then press it again to start. If you are on an iMac or Mac Mini, ​the Power button is on the back of the monitor. Similarly, press it for a few seconds and release when it shuts down. It's annoying to see Mac keeps freezing or frozen to death, and that happens from time to time. Reasons vary from case to case, while the common one is Mac uses up the RAM memory and has to opt for disk memory. But there are things you can do to fix the issue, though it depends on what kind of "freeze" you're facing. One more thing: don't forget to back up your Mac data on a regular basis. Because when your Mac is totally frozen you'll have to force quit apps or reboot, during the process you may lose some files due to not being saved in time. A backup is golden protection plan for data disasters. Have you managed to unfreeze your Mac? Or you happen to discover a new solution? Leave a comment and let us know.